De pups zijn geboren op 9 augustus 2013, 3 reutjes! 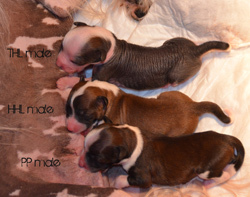 On the 9th of August 2013 3 males are born! 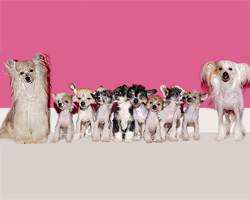 Our goal is to breed healthy, sweet and beautiful dogs. We put all our love and care in this breed. 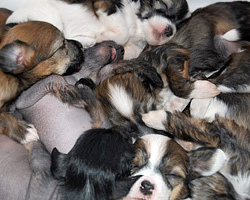 I have regular contact with all our puppy buyers and puppies, and we are always ready to help where ever we can. The future of our puppies is in our hands, that is why we are very selective with choosing great new owners. 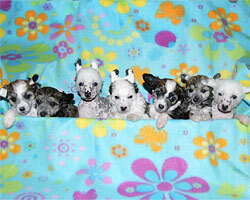 If you are interested in one of our (coming) litters, please sent us a detailed email. 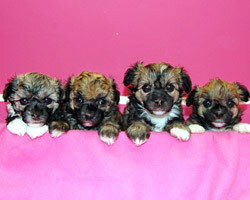 All pups will of course get a FCI Pedigree and go with a contract and a puppy-package to their new owners. All our dogs are shown with Excelent results, also do they all have great personalities. Health is very important to us. That is why all breeding dogs will be tested on most possible heriditary diseases. Test results of the ECVO, prcd-PRA, PLL and Gonioscopie tests can be found on the individual pages and if you have questions, please ask them. 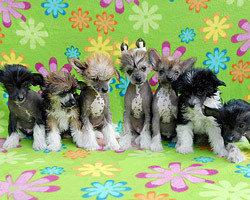 I'm a member of the Dutch Chinese Crested Club. Our pups grow up in our living room between the other dogs, us and our daughter. They get all the love and attention they need and deserve. The first 8-9 weeks of their lives they will be socialised by visits to friends, car driving, contact with other dogs and (to them) unknown people. 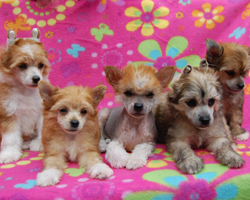 Besides that they get their regular check-up at my vet, their vacinations and they are dewormed every 2 weeks. If you should have special wishes we are always willing to see how we can help in any way.